What is a fact, and does the truth always have to contain those facts? At first glance, those concepts seem insane. Of course a fact is a fact, and the truth must contain facts. 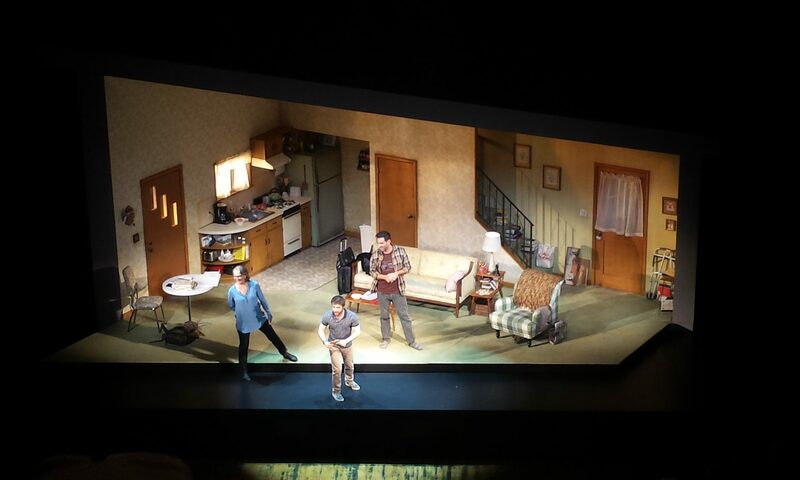 But the new Broadway show, the Lifespan of a Fact, questions those notions. And whether or not it convinces you of one side or another, it will make you think. Is The Lifespan of a Fact Appropriate for kids? I’ll get to that later. The drama/comedy is based on a book of the same title, though of course liberties were taken in writing the play. 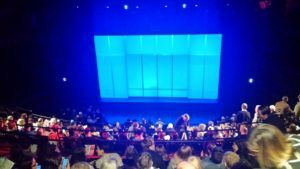 Or as the show’s website says in a cheeky way, “a new play based on a true-ish story.” Here’s the set-up: a post-college magazine intern is asked to fact check an essay (not an article!) from a talented writer who is known to be loose with the facts. He’s an artist. 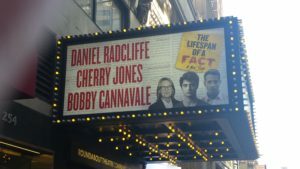 The fact checker (Daniel Radcliffe) takes the job way too seriously for the editor’s (Cherry Jones) liking, coming up with a 100+ page Excel spreadsheet with factual questions. The author, played by Bobby Cannavale, is not happy to be dealing with an intern, let alone anyone fact checking his precious work. There’s not a lot of action in the play – it’s word-driven and cleverly written. The drama comes from the intern’s questioning of the author’s facts, which the author admits are often slightly off, but needed for the flow and structure. The interesting part comes from the debates and concepts about what is a fact, when it becomes a fact and when it’s okay to deviate from the facts to tell the greater “truth” of a story. Point of view is everything, in this debate. The magazine editor has the responsibility of running a journalistic organization which relies on facts and can be sued for anything misrepresented. The essayist is trying to tell his truth in an effective, and artistic way. And the intern is trying to do his job, making sure the facts are the facts, to the point of ridiculousness. As a journalist myself, I found it all fascinating and somewhat familiar. But those who are not journalists will enjoy this too. My teen daughter had been talking about similar concepts at school recently, so it struck a chord with her. 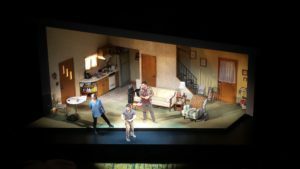 I was not familiar with the essay What Happens There (which ran in the Believer after 7 years of fact checking) or the book The Lifespan of a Fact the play was based on, before seeing Broadway show. And that’s okay. I did read the essay later (which was kind of fun to do in retrospect). Now I’m curious about the book, which details the fact checking emails between the author John D’Agata and fact checker Jim Fingal. We really enjoyed the show. It wasn’t perfect. Some of the facts that Jim was checking were repeated throughout the show ad nauseum, and not to good effect. There were enough other issues they could have debated without repeating ones that just seemed kind of stupid after hearing them the first time. The play condenses what was 7 years of fact checking into a long weekend, which is fine and creates additional drama. Spoiler alert: Jim flies to Las Vegas for research, and ends up confronting the author in person. The editor ultimately flies out as well. It’s never said where they fly in from. While not all magazines are based in New York, a huge number are (as is the Broadway show). Probably the author could have thrown in a line to say they were flying in from somewhere closer, as it made no sense that with very little time to waste, the fact checker and the editor are jetting to Vegas for a plot artifice. Someone later told me that the publishing magazine was based in Los Angeles, so that made more sense, but a quick line in the script would have been helpful. Lastly, the ending of the show drove me nuts. Some liked it. I would have been happier with a more defining ending. Is The Lifespan of a Fact Appropriate for kids? If your kids are in high school, maybe. In spite of Daniel Radcliffe’s appearance in the show (well, more than appearance – as one of three main characters), the show is for adults. There is adult language, and multiple references to teen suicide (the subject of the essay) and some details about that. Also, not many kids would be excited to watch a play debating facts. The Lifespan of a Fact is playing through January 13, 2019. So go before then. We sat in the upper balcony, in the last few rows. We could see fine. Yes, it would have been nicer to be closer, but ticket prices. At the end of the show, Radcliffe auctioned off an oven mitt made by Cherry Jones. In addition to it being hilarious to watch bidding reach $1500 for an oven mitt she made with a child’s kit (money raised for Broadway Cares), it was shocking to hear Radcliffe change from an American accent to a British one. I know he’s British. But his American accent is all we heard throughout the show, and it was perfect. Tickets: Here’s how to get discount tickets for The Lifespan of a Fact and any Broadway show.